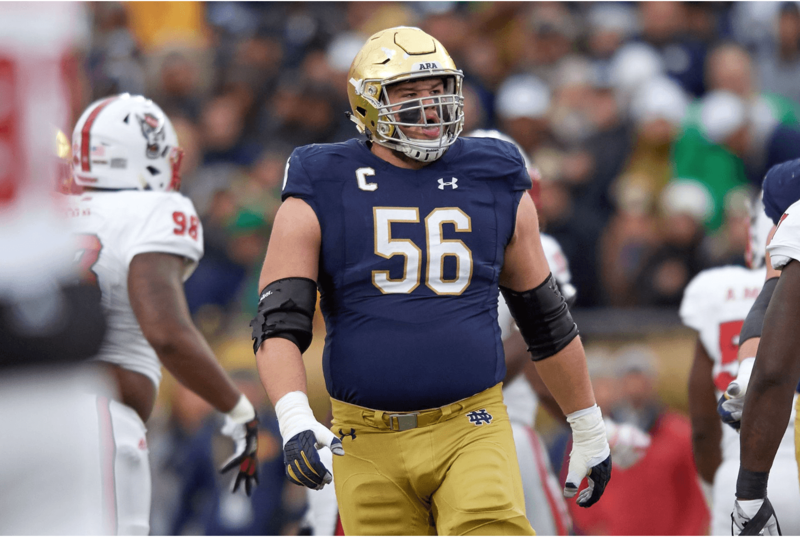 Throughout this process I have written quite a bit about just how good of a player Quenton Nelson is. The Indianapolis Colts clearly felt that way too as they wasted little time in selecting the Notre Dame guard. Nelson gets to stay in state as the Colts official twitter account welcomes him aboard. His former college coach, Brian Kelly even jumped in to talk about the pick. He may be bias…but he’s also not wrong at all. Nelson very well may be the best player in this draft class and he certainly figures to make a positive impact on the Colts this year. He’s a big time talent at the guard spot who plays a nasty brand of football. The Colts need that in the worst way, as this team lacks any kind of edge. Nelson also plays into Chris Ballard’s plan to run the ball more in the years to come. The former Fighting Irish star is an excellent run blocker and his athletic ability allows him to get up field and provide a pivotal lead block. Above all this is a move with Andrew Luck in mind, and that’s hard to argue with. The previous regime failed to protect Andrew Luck over the course of several seasons, and it has cost them dearly. With Luck recovering now, Nelson provides the kind of pass protection this team needs. The left side of the line is much improved now with Nelson joining Anthony Costanzo and center Ryan Kelly. Overall this was a slam dunk for the Colts. They get a premium player after making the trade with the Jets and now have their chance tomorrow to further supplement this roster. Look for them to target defense and a running back in rounds two and three. The weekends off to a good start Colts fans, now the real fun begins for Ballard and company.